Seven years ago, the world watched as waves of non-violent protest swept across the Arab world. It began in Tunisia and quickly spread to other countries. The movement was optimistically called the Arab Spring by protesters. It has become the long Arab Winter for those in Syria. Last week marked seven years since the start of the conflict in Syria, with more than 2,500 days of brutal violence and bloodshed. As bombs continue to rain down on besieged Eastern Ghouta, civilians are trapped with nowhere to run and nowhere to hide. The so called ‘de-escalation zones’ have in fact become ‘escalation zones’. Meanwhile, the world looks on as the conflicting parties blatantly disregard international law. As the Syrian government moves to reclaim control over the last rebel-held areas, it is timely to ask: what is the future of Syria? And even more pertinent to ask: will it ever be safe for Syrians to return home? It seems difficult to conceive that Syrians who have witnessed and experienced such brutal atrocities would ever feel safe returning home. It is also difficult to conceive that there would be much for Syrians to return home to, especially in Aleppo, Raqqa and other areas where homes, marketplaces, hospitals and schools have been pounded to rubble by bombs. But many Syrians continue to dream of returning home, especially those who face protracted uncertainty and rising anti-refugee rhetoric in the places to which they have fled. So what will become of Syria? With much of the country’s vital infrastructure destroyed, talk of reconstruction has already begun. Thousands of destroyed schools, hospitals and homes need rebuilding. A number of international ‘Trade Fairs’ on Syrian reconstruction have already been held. It is reported that foreign contractors have begun descending upon Damascus to secure lucrative reconstruction deals – seeking to profit from Syria’s destruction. 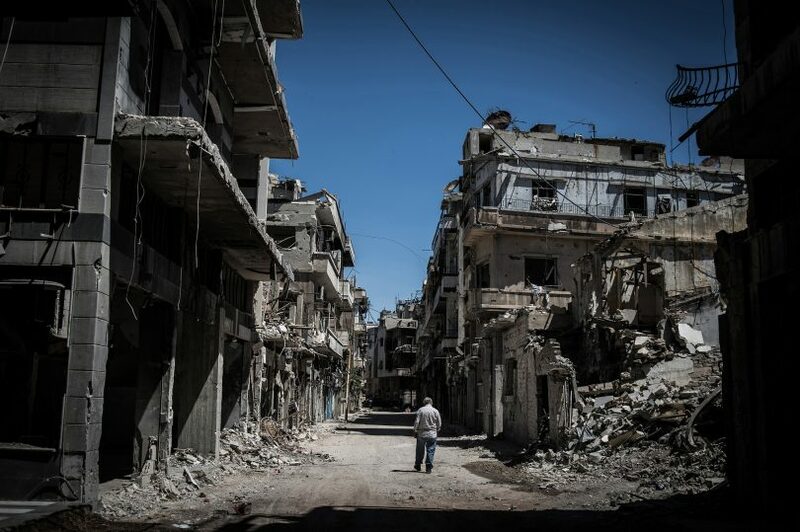 As minds turn towards reconstruction and while battles are being fought in besieged areas, it is critical that the international community heeds the cry of civilians: cries for safety, security and stability. This requires ensuring a potentially premature focus on reconstruction does not detract attention from three key things. First, more pressure must be put on all parties to comply with the United Nations Security Resolution, demanding a cessation in hostilities to enable civilians trapped in besieged areas to access humanitarian assistance. Humanitarian aid, including medical supplies – which were last week stripped from aid convoys, must be allowed to reach people in need. Sick and wounded children must be allowed access to medical care, and life-saving aid. Second, it is critical to ensure that Syrian refugees are not forced to return to Syria on the premise that the ‘war is over’. The reality is that many Syrians may never feel safe returning home. Much of the country is littered with explosive hazards, including mines, unexploded bombs, cluster munitions, grenades and rocket shells. Furthermore, the war has shattered Syria’s economy and infrastructure, limiting access to water, food, electricity, healthcare, education and livelihood opportunities. Accordingly, it may be a long time – possibly decades – before returnees can live in safety and dignity. It is therefore critical for the wishes of refugees to be respected, and that they are presented with options other than an unsafe return to Syria, including resettlement in neighbouring countries and beyond. Finally, it is critical for donor governments to continue to provide humanitarian and development assistance to support the needs of Syrians who may be unwilling or unable to return home, and to those seeking to rebuild their lives in Syria. Such assistance must not be undermined by a premature focus on reconstruction aimed at returning refugees – whose lives could be at risk – to Syria. The end of the conflict in Syria will not bring an immediate end to humanitarian needs. The conflict has resulted in the displacement of half the pre-war population, with more than six million people displaced within Syria, more than five million refugees in neighbouring countries, and a million refugees in Europe. The enormous humanitarian need created by this conflict will continue long after the last bomb has been dropped. It is critical that the international community maintains its commitment to supporting those impacted by this crisis, whether they be inside Syria, in neighbouring countries, or beyond. In particular, it is crucial for the United Nations and donor governments to use diplomatic efforts to ensure that the rights of Syrians are respected by any post-war government. Any funding given to support stabilisation and reconstruction must promote enduring and sustainable peace in Syria. Research shows that the vast majority of countries that have experienced civil war are likely to see the recurrence of civil war unless the reasons for resorting to mass violence are addressed. If the root causes of the conflict are not tackled, will Syrians be able to live in safety and dignity? Syrian refugee resettlement: are Australia and New Zealand doing their fair share?